Menard has been awarded this year's RDML Edwin T. Layton award, which honors mid-to-senior active or reserve intelligence officers, chief warrant officers, and enlisted personnel for their outstanding leadership and mentorship in the furtherance of naval intelligence performance. Menard said he was humbled when he found out that he was nominated, and emphasizes that the credit does not go to him exclusively. "The crew did all the work," Menard said, adding that he has been privileged to work with an outstanding group of officers and enlisted personnel who did a tremendous job performing the mission at hand and informing the fleet on matters of intelligence. "I was just very fortunate enough to be in the right place at the right time." 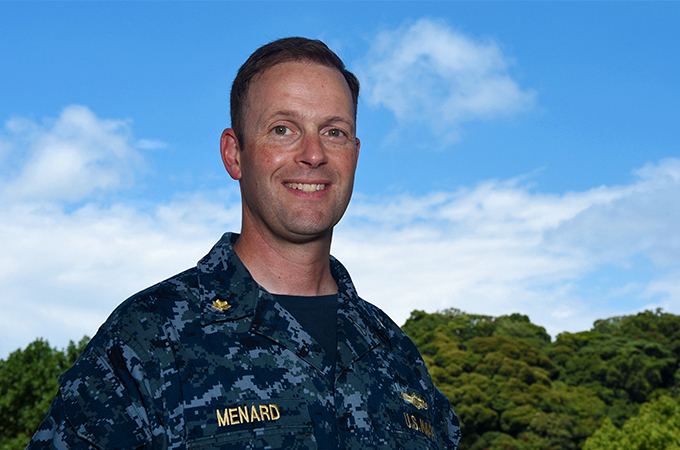 With a 13-year naval career under his belt, Menard credits his involvement in community service before he joined the Navy for his leadership abilities. "Working in my church and being an active leader at work were both really instrumental in getting me ready to take on leadership in Navy," he said. Receiving the leadership award—which was established in 2001 and named after Edwin Thomas Layton (1903-1984), a rear admiral in the United States Navy noted for his work as an intelligence officer before and during World War II—was just one index of how Menard has exceeded his command's expectations of being a capable leader and mentor for his people. Menard said he hopes to continue to prepare junior sailors and officers to be well rounded and competitive as the next generation of leaders.